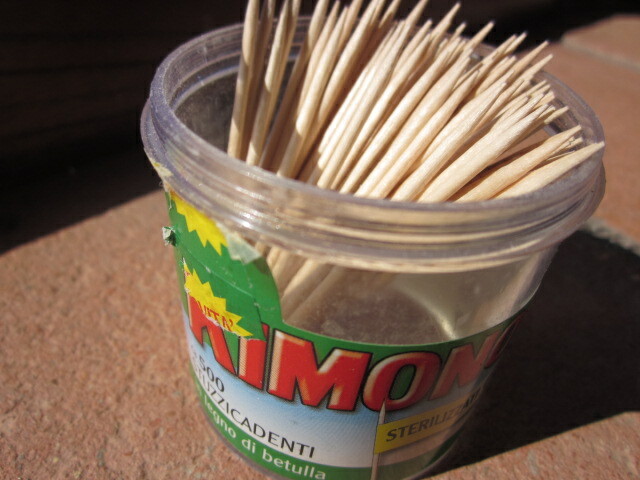 Ah, the ever popular stuzzicadenti, toothpick. Yes, they are readily available the world over. In any grocery store, a hundred can be had for a few coins. 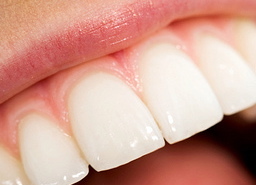 But the picking of one’s teeth shouldn’t be limited to processed slivers of wood. Oh, no! 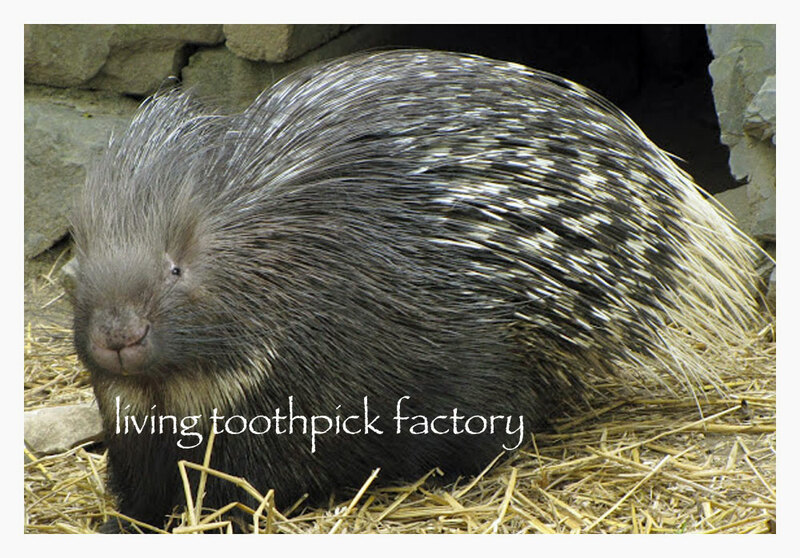 For those of you who are already a bit confused by the title, we’re not suggesting that istrici, porcupines have discovered the secret to perfect teeth. Certainly not! Most of them have nasty overbites. But, we are saying that the curious gift of the porcupine can make a difference in our dental hygiene, while making the world a better, tidier place. All we have to do is start using quills instead of toothpicks when the judicious picking of i denti, teeth becomes necessary. Let us lay out the argument and then you can decide for yourself. To paraphrase Wikipedia, the most revered and respected source of real knowledge in the entire world, somebody somewhere says that: A toothpick is a small stick of wood, plastic, bamboo, or other substance used to remove stuff from between the teeth. They can also be used for picking up small appetizers (like cheese cubes or olives) or as a cocktail stick.” Note: In our proposal we’re not trying to cover the entire gamut of tooth-pickery and materials. Our focus is primarily on the wooden implements, leaving the plastic and bamboo market to others, so inclined. Wiki also reports that wooden toothpicks are usually made of birch wood. Trees are cut, chopped and milled into individual toothpicks that we all enjoy the world around. Not to criticize Maine or anything, but that’s where most of them come from—transported on expensive, polluting trucks and ships, no doubt. Chewing on twigs gave way to toothpicks as the oldest form of teeth-cleaning known to man, dating back to prehistoric times. Stop to think about it. Can you imagine how many of those little sticks have been fashioned over the millennia, and how much money and psychic energy has gone into creating them? In the 17th century, the toothpick frenzy reached its most decadent point when they were considered luxury items like jewelry and were made of silver, gold and precious gems. Surely, you’ll agree with us that indulgence in opulent pick-ware is a bit over the top. Don’t you think? But back to our story. 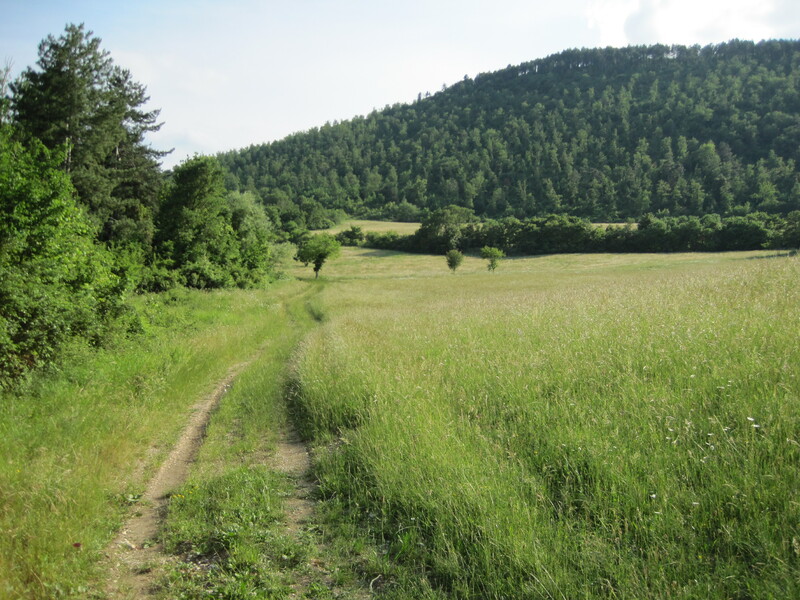 Over our many years in Italy, we’ve made it a priority to take a daily meadow/woods walk to relax, and enjoy an hour of conversation that results in discovering solutions for a few of the world’s most pressing problems. Whilst walking and talking, we frequently come upon dispatched porcupine quills, which we always gather up as if they were precious. In fact, one rests on the bookshelf in the bedroom—part of some shrine? On occasion, it has served to dislodge an errant sesame seed or the like, and that’s what led to our brilliant idea. Here’s our proposal: Why not use porcupine quills instead of wood? Maybe the system could operate like the “adopt a highway” program where kind-hearted individuals take responsibility for specific regions, in which they could harvest quills found naturally “in the wild.” The quills could then be gathered and cleaned, you know, sanitized for your safety. That certainly could help the jobs market. Then the clean quill-picks could be offered from a barrel placed at each of the local pharmacies, police stations or churches. People could pick one up as they pass by, while doing their errands, going for a haircut, or whatever. 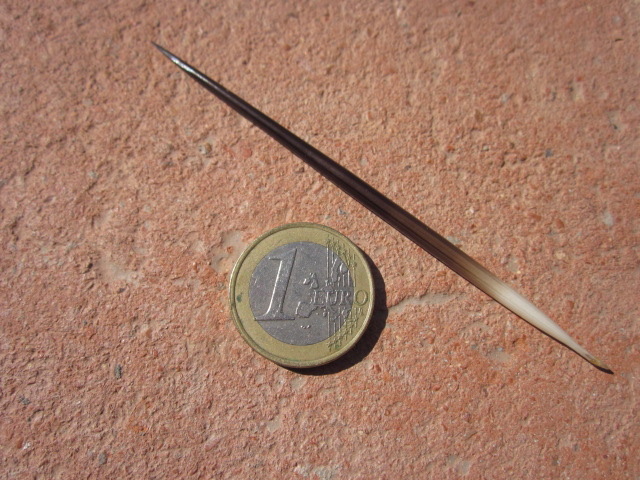 The quill-picks would always be available as the need arises. You could even have a return bin for recycling since they’re nearly indestructible. The sanitation crew, the Quill Guild, could give them a little wipe-down and they’d be ready to go again. As you’ve no doubt concluded, the beauty of this idea is that they’re both biodegradable yet long-lasting at the same time. Nature’s incredible little wonder-product! They last so long, you would probably only need one for an entire lifetime of picking and gouging—if you’re careful. No more soggy wooden ends to contend with or spent ones lying around the house. Okay, so we do have a hidden agenda. The real motive goes beyond our sincere concern for the environment, volunteerism and making money. 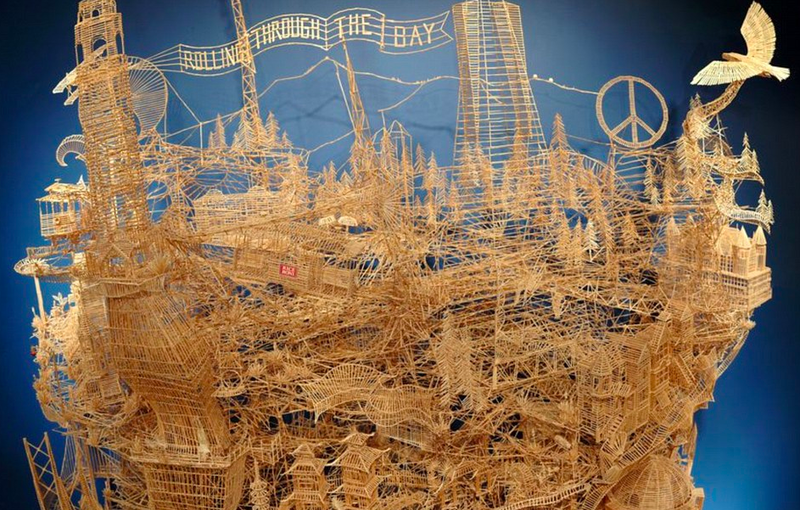 Secretly, we’re trying to “free up” more wood toothpicks to use as art—as in Scott Weaver’s mind-boggling project of creating a 100,000 wooden toothpick model of San Francisco. Or, there’s the Appalachian man who captured the world record by holding 2,747 toothpicks in his 16-month old beard. Creativity like that needs our support. Just imagine how much better the world could be, just by implementing this simple idea! And we’re not just nit-picking—that’s a different topic altogether. Just don’t get us started on popsicle sticks!